The truth is....we have NO Buzzards in North America. Buzzard is the correct term for a family of hawks. (ie the European buzzard, Buteo buteo, closely related to the American red tailed hawk). In North America, the term is often incorrectly utilized when describing vultures. The first English colonists likely saw our Vultures. Since there are no vultures of any type in England, these pioneers probably gave the common term "buzzard" to all the soaring figures above the New World. That said, we got a call for a "buzzard" the other day. The little guy had been found on the ground and other birds (likely crows) were picking on it. I immediately wondered if it really was a vulture or a hawk. When I picked him up, I knew right away that he was a Black Vulture. The little one was barely a week old. A solo orphaned vulture in a rehabilitation center is destined to a future in captivity because they are such social beings. Therefore, I immediately began calling around to other rehabilitators to find him nest mates. I finally found a rehabilitator who has two other babies. So, ours will go with hers and he will have a much greater chance for release. In this case, the baby may have something wrong with him because other birds were picking on him. He does demonstrate a potential deformity in the leg. However, should you come across a baby vulture on the ground, take a careful look at the situation before you jump to conclusions. Remember: American vultures DO NOT nest in trees. They lay their eggs on the ground, in caves, hollow logs or other cavelike structures. Sometimes the nest (which doesn't appear nestlike at all) will be a simple dip, scratched into the ground, seemingly out in the open. Many hikers who happen upon such a nest believe that they have discovered a hawk that has fallen from its nest. If you see any evidence of nesting activity, you have probably stumbled on a nestling waiting for his parents to return with food. The best clue that you have discovered a nest is the presence of multiple babies. Please leave them be, unless one or more appear visibly injured. Vultures do NOT eat live animals. They will not hurt your pets or children. A group of vultures is called a "Venue". Vultures circling in the air are a "Kettle". American Vultures have a sense of smell, but African vultures do not. The Turkey Vulture has the best sense of smell of the American vultures. Vulture poop is actually a sanitizer! Their uric acid is so strong (because of the nature of their diets) that it kills bacteria. Vultures have excellent eyesight, but they have poor vision in the dark. American vultures find food both with their eyesight and sense of smell. Vultures prefer to eat fairly fresh meat. They will turn their noses up at rotten meat if there are alternatives available. They also prefer the meat of herbivorous animals, avoiding that of carnivores. Circling vultures do not necessarily indicate the presence of a carcass. Circling vultures may be gaining altitude for long flights, searching for food, or playing. Vultures are attracted to the smell of mercaptan, a gas produced by the beginnings of decay. Therefore, they serve as indicators of natural gas leaks, because they are attracted to the smell. Male and female vultures are identical in appearance. 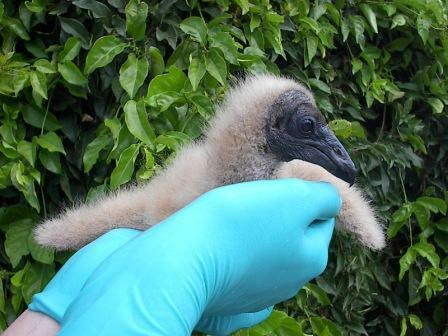 To learn more about Black Vultures, visit the Patuxent National Bird Banding Laboratory.